Nico J. Genes was born in Romania. She left the country soon after completing her Master’s degree in Economics. She traveled and worked with many interesting and unique people who had different nationalities, religions and sexual orientations which helped her understand and appreciate diversity and accept others just as they are. 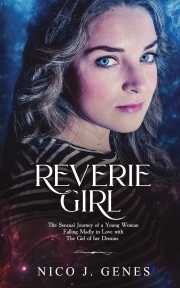 Reverie Girl is her second book from The Reverie series. Magnetic Reverie, the first book from the series, was published worldwide in May 2017. With her first novel she broke the ice into writing successfully and now with the second one she continues the path of achieving her goal to become an established writer. From the readers’ feedback and reviews Nico can proudly say she has the confirmation of her writing skills. Besides novel writing, Nico also runs a blog in which she talks about life’s issues, and gives that friendly advice everyone needs at certain points in life. Nico currently lives in Slovenia. She is eager to hear from you on www.nicojgenes.com and social media (Facebook, Twitter, Instagram, LinkedIn, Goodreads).